I have anticipated this day for almost an entire year. I set out early to walk this morning and was kissed by waves of scent–apple blossoms, honeysuckle and my favorite, lilacs! The fragrances blended like no perfumer could have possibly managed, yet the air wafted their delights without the cloying odor that so many cosmetic counters dispense. The lilacs struck a chord in my memory. One thought led to another and soon I was reminiscing on Michael Kors Spring 2015 line. I have not seen much of his fabulous floral inspired pieces in the stores here, so I went back to his website to refresh my memory. Here he shows lilacs, among many other flowers as pattern with gingham, laces, chiffon and linen. It is the floral prints that set this Spring collection apart in my estimation. 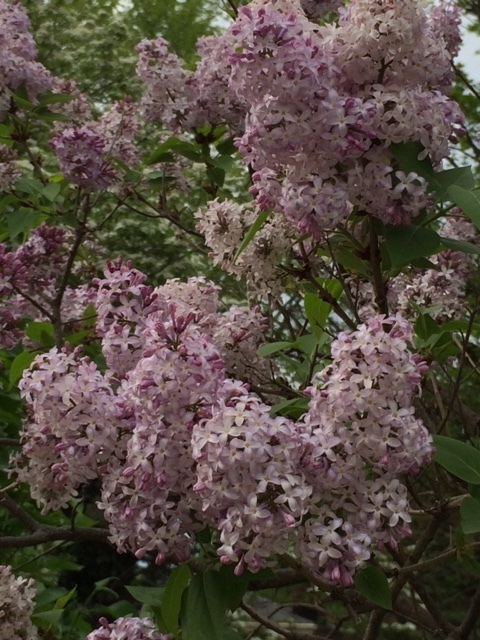 They speak to my senses and draw me to that long awaited day, the day to which I awoke today–the day of lilacs in bloom! Previous:Wondrous Wednesdays…a Day late but a dress cuter!